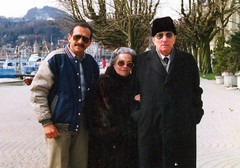 When we remarked that the wife is usually the decision-maker in the family, Mrs Sidhom laughed. “Oh no, this was impossible in our generation,” she said. “Antoun was conservative, but we communicated well and our discussions were fruitful. We asked Mrs Sidhom how Watani was conceived. “In the late 1950s the State had full control over the press,” Mrs Sidhom said, “Antoun felt that the Coptic voice went missing from the newspaper domain, and he thought of creating a paper as a stand for the Coptic, non-religious voice. For two years he studied and prepared his project. His goal was very clear from the beginning. I was never fearful or doubtful because I knew that Antoun was moderate, and was sure God would stand by him. When the first issue of Watani was out we felt really proud of the work. In 1960 Egypt’s president Gamal Abdel-Nasser issued the socialist decrees through which most private businesses were nationalised and private ownership highly restricted. “Antoun lost all his money,” Mrs Sidhom said. “He came from a middle-class family and was a self-made man; all his money was in shares and stocks of companies that were then nationalised and were assessed by the State to be worthless. His accounting office, which was among the first accounting offices in Egypt, lost its bigger clients since all companies then became public sector and their accounts were handled by the Central Accounting Authority.” Mrs Sidhom sighed. “Yet never did Antoun lose his faith, he always said that God had given, God had taken away, and His name will be blessed. We worked hard at making ends meet without the children feeling the crisis. Together with two accountant friends Antoun established an accounting office in Tripoli, Libya, and used to shuttle between Cairo and Tripoli. God’s hand was with us and we overcame the crisis. “The paper went on uninterrupted,” Mrs Sidhom recalled, “except when it was suspended, among other Egyptian papers in September 1981 when President Sadat cracked down on many intellectuals and political figures, whom he regarded as political opponents. At the time we were in London on a business trip for Antoun. We were horrified and distressed at Sadat’s decision, and when we were back in Cairo a month later Antoun took the matter to court. Watani resumed publication in 1984 by court order. Was Mrs Sidhom a critic of her husband’s writing? “I always read Watani critically, and when Antoun began writing the editorial I became even more critical since I feared for his security, especially that this was a time when the security apparatus used to clamp down on critics of the regime. I prayed to God to protect him. His writings were very brave and daring at a time when censorship of the press was in its prime. He used to receive many threats, sometimes by phone and sometimes through telegrams or mail, I always tried to conceal my worry from him so as not to put more pressure on him. As for Antoun, he was convinced that since he was writing the truth he would keep conveying the Coptic voice to everyone and that God would always stand by him. “Antoun was very happy when Youssef expressed a wish to join the team at Watani, because this had always been his secret wish. But he wanted Youssef to take the initiative so that he would have his heart in it. Antoun welcomed him and advised him to attend the Monday editorial meetings. For two years Antoun kept a close eye on Youssef until he was sure that Youssef had grasped the work at Watani so advised him to start writing if it was really his wish to remain with the paper. Youssef did start writing and remained beside his father at Watani until his last days. Since then he took over, a new Sidhom at Watani’s helm”. A Copt and a woman for vice-president?